When Gavin Hastings captained Scotland at Twickenham in the final Five Nations Championship match of the 1993 season, he was a few months away from skippering the British & Irish Lions' tour to New Zealand, pipping England's Will Carling to the role. The following year, a Scottish rugby magazine asked its readers to vote for the greatest Scotland players of all time, and Ken Scotland was selected at full-back with Andy Irvine at right wing. Hastings was on the bench. Such is the ever-changing nature of public and sporting acclaim. What is certain is that whenever Scottish rugby lovers get together to nominate a fantasy team, Gavin Hastings is either in it or very close. 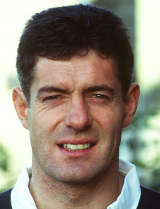 That other men (including David Sole in 1990) led Scotland to Grand Slams counts against his chance of being captain, but the Edinburgh-born full-back (he was rarely seen in any other position) was a great exponent of the forceful attacking play pioneered by his predecessor in the 1950s and 60s, Ken Scotland. Hastings was also a fine goal-kicker, often from long distance, although as with any player who takes on this task there are blemishes on his record. Most famously he missed from in the front of the posts against England, the Auld Enemy, at Murrayfield in the 1991 World Cup semi-finals, when the score was 6-6 in the second half. Had the kick gone over, it might have been Scotland against Australia in the final at Twickenham and then, who knows? There were many happier occasions, often shared with his brother Scott, the centre who was his team-mate with club, country and the Lions. In 1995 in Paris, Scotland broke their 26-year winless streak in France when Gregor Townsend's flipped pass sent Hastings storming through to the line. The shift in the modern full-back from last line of defence to galloping attacker was rarely demonstrated better. Hastings was educated at George Watson's College and captained Scottish Schoolboys to a win over England. He won his blue at Cambridge, captaining them to victory over Oxford in 1985, and also played for Watsonians before he and Scott made their Scotland debuts against France at Murrayfield in January 1986. Gavin was 24 and Scott was 21. The ups and downs of that match summed up the elder Hastings' career. He kicked into touch, turned his back expecting the scrum and the French threw the ball in and ran it up the touchline for a try. Hastings recovered to kick a then Test-record six penalty goals and Scotland won 18-17. No Scot will forget his five penalty goals and three conversions in the record breaking 33-6 win over England the same season. Hastings also gave crucial impetus to the move which created Tony Stanger's try in the 1990 Grand Slam decider. "Big Gav" (he was 6ft 2in and 14st 8lb) played all three Tests on the victorious 1989 Lions tour of Australia, and although his 1993 side were defeated 2-1 in the series, they were within a whisker of turning the All Blacks over. Hastings is the record Lions scorer in Tests with 66 points. He won 61 caps for Scotland, 20 as captain, and was their leading scorer with 667 points until Chris Paterson overtook him in 2008. He was the top scorer in World Cups with 227 points until Jonny Wilkinson passed that total in 2007. Hastings scored 17 tries for Scotland, played for the Anglo-Scots and Edinburgh district teams, London Scottish and the Barbarians and was awarded the OBE. He also played club rugby in New Zealand and appeared in the Hong Kong Sevens. His modest nature and dry wit have endured beyond his playing career and he was inducted into the International Rugby Hall of Fame in 2003. There was the diversion of a brief and personally unsuccessful dabble into American Football, as a kicker with the Scottish Claymores of the WLAF in 1996. Hastings missed four of his 27 extra point attempts, and missed his solitary field goal attempt, although the Claymores won the World Bowl that year at Murrayfield. In August 2007 Hastings, having gone into the business of sports marketing with his company Hastings International which was then sold to Platinum One, was announced as the chairman of the reconstituted Edinburgh Rugby professional side. And he helped promote the 2008 Golden Oldies Festival in Scotland.